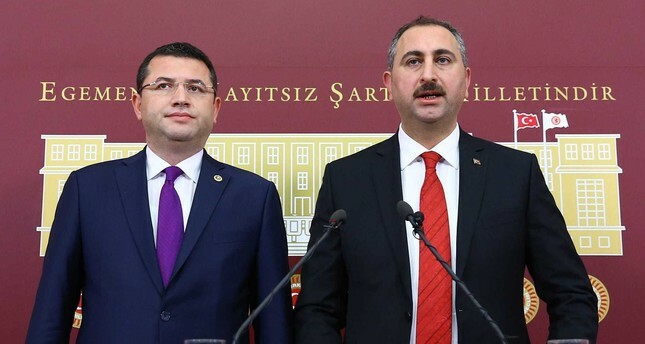 The AK Party General Secretary Abdülhamit Gül and MHP Deputy Mehmet Parsak, speak at the joint press conferance in Parliament regarding the new constitutional package. Turkey's long-debated constitutional reform package that will allow the country to switch to a presidential system has been submitted to Parliament on Saturday. Details of the 21-article bill indicate that the reform package will not only change the Turkish Constitution and governing system but it will also initiate new reforms that will be significantly important to the democratization process in the country. On Saturday, the ruling Justice and Development Party (AK Party) and the opposition Nationalist Movement Party (MHP) reached an agreement on the draft for the long-sought constitutional reform and submitted it to Parliament. If the proposal is passed in Parliament and voted for by the public in a referendum, Turkey will undergo a transitional period until 2019 when the new system will come into full effect. Moreover, during this period there will be no early elections and both the presidential and parliamentary elections will be held on the same day in 2019 and every five years thereafter. The bill would abolish the prime ministry and allow the elected president to maintain ties with his/her own party. Accordingly, the president will be elected by public vote and will be able to serve two five-year presidential terms. Currently, the Turkey's Constitution states that no appeal shall be made to any judicial authority, including the Constitutional Court, which goes against the decisions and orders signed by the president. However, the proposed change will grant the parliament oversight of the president's actions, to a certain extent. The new bill allows the parliament to set up an investigation commission and even begin impeachment proceedings against the president. The parliamentary investigative commission would be set up by a simple majority vote and, upon receiving two-thirds' majority in parliamentary votes, will be able to implement legal impeachment proceedings to put the president on trial in the Supreme Court. In line with Europe, the bill also reduces the age of candidacy from 25 to 18 and, in the context of the growing populace, the number of deputies in the parliament will be raised from 550 to 600. In addition, parliamentary deputy candidates who are not elected will serve as substitute deputies if the deputy seat from their respective electoral region is vacated. According to the proposed changes, the president will have the authority to appoint vice presidents, ministers and high-level public officials following the abolition of the prime ministerial post. However, the authority to propose the bill of law will belong to lawmakers. The president would be authorized to prepare and present the budget law and the budget would be accepted with the approval of parliament. The president will also have the authority to issue decrees like the U.S. presidential system and the president will be able to abolish parliament. However, when the president uses this right to abolish parliament, his term will also end automatically and the country would have to go the elections again. The proposed bill also includes changes that are considered significant reforms for Turkey's democratization process. Following the failed July 15 coup attempt, the AK Party, the main opposition Republican People's Party (CHP) and MHP representatives agreed on a small constitutional package. The package includes articles which would decrease the size of the National Security Council (MGK) and remove the gendarmerie forces from the MGK, as well as the abolishment of military high courts within the scope of eradication of discriminatory practices between military and civil courts and the division of the Supreme Board of Judges and Prosecutors (HSYK) into two parts –the Board of Judges and the Board of Prosecutors. In addition, the parliament and president will be authorized to select members of the HSYK amid aims to remove members of the Gülenist Terror Group (FETÖ) sympathizers from within the judiciary. In line with the agreement, the bill will also alter the structuring of the HSYK. The new HSYK will be comprised of 12 members; half of whom will be elected by parliamentary vote while the remaining half will be elected by the president. Furthermore, military high courts will be abolished and the commander of the gendarmerie forces will lose his seats in the MGK. The amendment package is expected to be discussed by the Parliamentary Constitution Commission this week. Upon completion of the commission works, the proposal will be presented at the General Assembly in Parliament; most likely in January. The General Assembly will first discuss and vote on each article before the entire constitutional amendment package goes to a parliamentary vote. Each of these voting stages requires a minimum of 330 parliamentary votes. Currently, the AK Party holds 316 seats in parliament and needs the support of MHP, which has 40 seats, to take the constitutional amendments to a referendum, which is expected to take place in spring of 2017.